I am going to describe it in words, but this is something you deserve to experience for yourselves. I write something about this memorable happening every year (3rd weekend in September) because it is a landmark event for my family and myself each fall. This year is the 14th annual Harvest Gathering if I remember right. For those of you just tuning in, let me give you the general idea once over lightly. I will include a link to the particulars below. I am a Sixties child, meaning I grew up in and through the 1960s. Part of me has remained back there ever since. While there is nothing quite like the 1960s, the annual Harvest Gathering comes closest to that spirit. I mean this is how it was back in the Sixties. In fact, I was shocked the first time I attended this gathering at the request of my daughter May many years ago, like going back in time. The Harvest Gathering began as a party for Midwest musicians after the summer festivals were over. It is not called a "festival," because most of those who came had played at festivals all summer and wanted to get away from that atmosphere and just be and play music with one another. These include many of the headliners of the big Midwest festivals. At first the gathering was not advertised, but over the years regular people (non-musicians) found their way in and, like myself, cannot get it out of their minds. Each year my whole extended family attends, as many as can. And it is not just for young people. People of all ages, colors, and creeds (including geezers like me), and tons of families and kids attend. Most bring tents and camp out on the 180 or so acres of the Bernard farm. Others stay in nearby motels. The farm has a working sawmill, a honey house, and a maple-syrup shack. People come from both coasts, many driving all the way. Like "Burning Man" in Nevada, the "Harvest Gathering" is where something real is happening in this country. I am told that folks are already gathering up on the farm to get ready and we are we are still two weeks out! Now this gathering is about music folks, but it also includes round-table discussions on spirituality, the environment, and all kinds of things like yoga, drum circles, and even a fiercely competitive basketball tournament. There are tents for kids to color, paint, make clay or whatever. You can bring the whole family because they are welcome. And where else can you see all the good bands in one place? The answer is: nowhere. Up to 100 bands come each year, all donating their time, to play with and for each other. There are four stages going all the time for 3 days; there is music until late, late at night. This includes ALL kinds of music. At the bonfires, people sometimes sing without stopping until the sun comes up -- that kind of thing. And there is great food of all kinds, home-cooked and organic foods, including pizza, organic burgers, incredible breakfast burritos, all kinds of coffees and teas – the works. I have even brought some of my musical friends to the gathering, including world-renowned sax player Steve Coleman and his band. Steve loved it so much that he came back another year just for the vibe. Last year I brought Karl Berger (voted Downbeat Magazine's best jazz vibes player for something like ten years in a row) and his wife Ingrid Sertso (incredible vocalist). They were wonderful and they also want to come back again. You get the idea; there must be something in the water or the air that draws everyone back each year. We all just want to be in that space once again. I wouldn't miss it. This world of Samsara (turmoil) we live in is often like a raging river. The Harvest Gathering is like a little eddy or secret bay, one quiet spot, where time is lived in slow motion and people interact together in a gentle dance of friendship and relaxation. I don't know how else to describe it. The fact that there still is a place like this in the world is amazing, and it is called the Harvest Gathering. If you can find your way to it (and you can if you try), do yourself a favor and make a beeline to this gathering. Step through the back of the wardrobe. All your new friends will be there waiting. Eternity always comes just in time, and now is the time. If you do come, stop by. 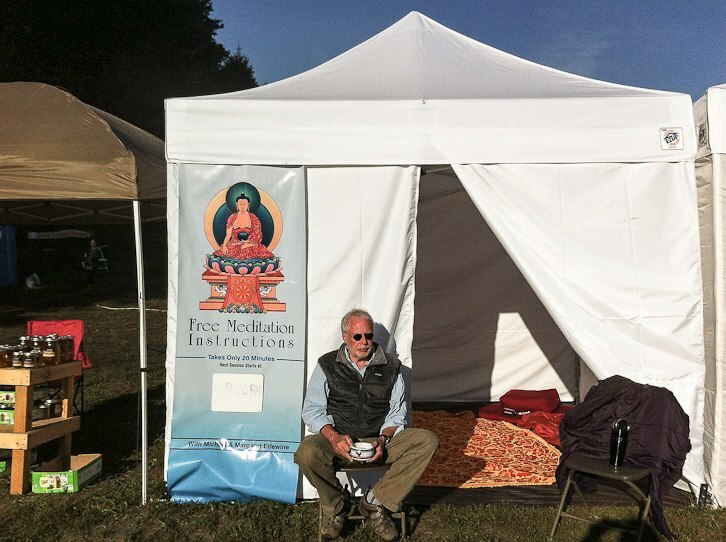 You will find me in a little white tent where I help folks learn basic meditation. Spend an hour with me learning to meditate or just talking. By all means (and that includes any means) come to the Harvest Gathering. You will never regret it and never forget it. However, I must warn you there is a lot of hugging and just being together that goes on. Here is a short video that will give you a taste and directions and details.